Google’s Director of Engineering and the Holy Awesome! Ray Kurzweil, Google’s Director of Engineering, is a real life mad scientist! He’s been putting effort into developing advanced machine learning. He hopes that machines could actually become virtual versions of people. Basically it would create a race of computerized zombies. Amazing. Check out the link for the full article and video. 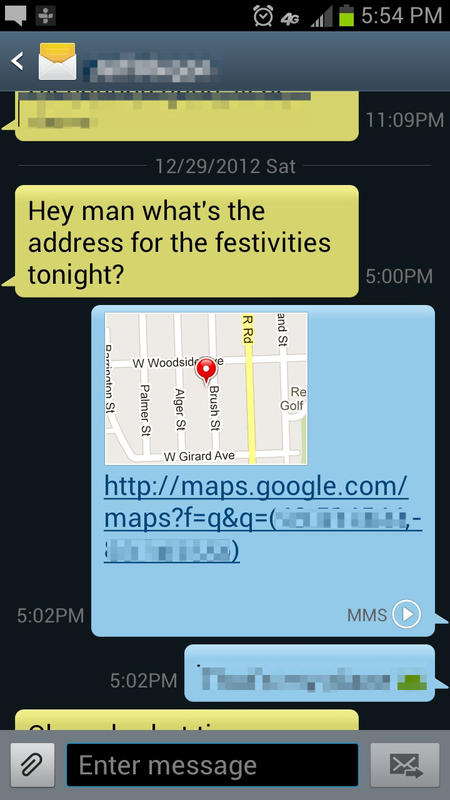 I’ve always hated typing in addresses to send someone a text when they ask for it or having to take an address sent to me and type it into a map/navigation app. I thought it was a huge advancement when my Android phone could recognize addresses and with a long press it would bring up a dialog to open the maps app. Recently I started using a feature that I just happend to stumble upon while trying to send someone my address. With my Android phone I am able to send a location through the Google Maps app. It will include a map view image and a Google maps URL that will take them to the location. On an Android phone you can open the Google Maps app and actually navigate to it making the process incredibly simple. I really like the idea and when it works it’s great! Some people have told me it doesn’t work well for them though so I’m guessing there is a snag in the line somewhere. From what I’ve read, not all messaging apps know how to handle the MMS message correctly so it gets corrupted. It would be awesome if it got put into the MMS standard and more people knew about it and used it. I graduated from Michigan State University with a B.S. in Computer Engineering with a concentration in Biomedical Engineering. I started my career working for IBM as an Associate Programming specialist. The spare time I had from working gave me the chance to teach myself how to program for the Android platform. After about a year working for “Big Blue” I felt that my talents and ambition had outgrown my position and I needed a change. I found out about Livio through the MSU career center and saw they were in need of an Android developer. I was hired for the position and haven’t slowed down since. The start up atmosphere really plays well with my drive; I am constantly challenged and never run out of problems to solve. The time to start my blog has been long overdue, so it’s starting today! I plan to post about my career, tricks in software engineering with interesting code examples, and all things technology. Oh, and if I throw in one or one hundred links to memes, comics, or cat pictures don’t be alarmed…because it will happen, and you’re welcome. I hope you all enjoy the blog!! !